A new USDA, tailored web tool designed to connect farm entrepreneurs with programs and resources available to help them get started. The site features advice and guidance on everything a new farm business owner needs to know, from writing a business plan, to obtaining a loan to grow their business, to filing taxes as a new small business owner. Using the site’s Discovery Tool, farmers can build a personalized set of recommendations of USDA programs and services that may meet their needs. The Fund-a-Farmer Project, a project of Food Animal Concerns Trust, awards grants for projects that help family farmers transition to pasture-based systems, improve the marketing of their humane products, or more generally to enrich the conditions in which the farm animals are raised. Together with our farmer partners, we are leading our country back to a food system that is both financially and ecologically sustainable. The Buy Local, Buy Wisconsin (BLBW) competitive grant program was launched in 2008 to strengthen Wisconsin’s agricultural and food industries. The grants work to reduce the marketing, distribution and processing hurdles that impede the expansion of sales of Wisconsin’s food products to local purchasers. NCR-SARE’s Farmer Rancher Grant Program is a competitive grants program for farmers and ranchers who want to explore sustainable solutions to problems through on-farm research, demonstration, and education projects. Farmer Rancher grants have funded a variety of topics including pest/disease management, crop and livestock production, education/outreach, networking, quality of life issues, marketing, soil quality, energy, and more. Farmer Rancher grants individual ($7,500 maximum), partner ($15,000 maximum), or group ($22,500 maximum) grants for ideas initiated by farmers and ranchers. Projects may last up to 22 months. About 50 projects are funded each year. The Environmental Quality Incentives Program (EQIP) is a voluntary program that provides financial and technical assistance to agricultural producers through contracts up to a maximum term of ten years in length. These contracts provide financial assistance to help plan and implement conservation practices that address natural resource concerns and for opportunities to improve soil, water, plant, animal, air and related resources on agricultural land and non-industrial private forestland. In addition, a purpose of EQIP is to help producers meet Federal, State, Tribal and local environmental regulations. 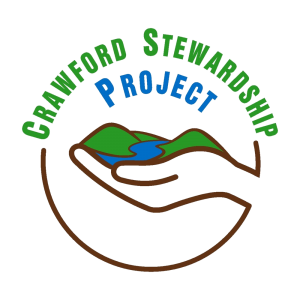 Land Stewardship Project’s Seeking Farmers-Seeking Land Clearing house Are you a beginning farmer looking to rent or purchase farmland in the Midwest? Or are you an established farmer/landowner in the Midwest who is seeking a beginning farmer to purchase or rent your land, or to work with in a partnership situation? Then check out LSP’s Seeking Farmers-Seeking Land Clearinghousefor the latest listings and for details on getting your own listing posted. To know what we should aim for, it helps to know what was there before. This study includes wonderful maps of what the pre-European Driftless landscape consisted of. As it turns out, largely oak savannah! With less than five months remaining in the current fiscal year, USDA’s Farm Service Agency (FSA) still has nearly one billion dollars available for farm loans to help family farmers across the country buy land. For new farmers out there, if you’ve been looking for farmland in your area and have been searching for ways to help finance the purchase, check out FSA farm loans to see if they meet your needs. Check out NSAC’s Grassroots Guide to Federal Farm and Food Programs for more information on FSA farm loans, including eligibility criteria and how to apply. 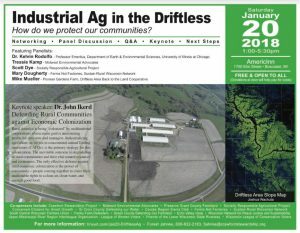 Grassworks has tons of free resources on grass-based farming systems. Please also refer to our Resources page. 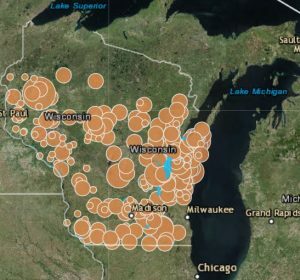 At their regularly scheduled meeting on February 20th, the Crawford County Board of Supervisors took up and unanimously passed a resolution urging the State of Wisconsin to recognize southwestern Wisconsin’s karstic geography and sensitivities of groundwater to pollution. This resolution also urged the state improve the oversight of the DNR’s Wisconsin Pollutant Discharge Elimination System (WPDES) program. See the resolution here. Great information from one of the areas most hard hit by factory farms. Good short factsheets on CAFOs, what they are, and how they operate. Pew Commission Report on Industrial Farm Animal Production recommends solutions to the problems created by concentrated animal feeding operations in four primary areas: public health, the environment, animal welfare, and rural communities. Established through a grant from The Pew Charitable Trusts to The Johns Hopkins Bloomberg School of Public Health. Read essays, see images, and learn what you can do to change the food system for the better on the website for this powerful book (all 400 pages of which can be yours for a mere $50). The Meatrix website offers information on the issues surrounding factory farming:, The Meatrix Interactive 360°, a tool to help people learn about factory farming, with in depth information on the issues; Animated movies – humorous and creative satires that use pop culture and entertainment to educate viewers about the food they eat and where it comes from; and The Eat Well Guide, an online directory of sustainable food from farms, stores and restaurants in North America, which was launched with the original movie to help people take action. Grace Communications Foundation highlights the interconnections of food, water, and energy, educating consumers, advocates, and policy makers through web-based initiatives. US and State Maps of concentrations of CAFOs, plus interesting facts.